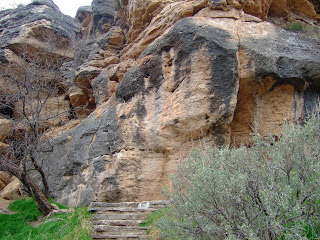 There is a creation myth that is connected to three Sacred Sites here in the Sedona area. The Yavapai Native Americans have legend of how their people came into existence. 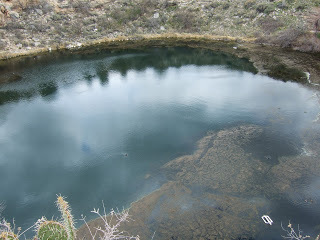 There had been an ancient people who lived underground where Montezuma’s Well is today. During this time the well was dry. It was before the Great Flood. The people had a knowing that the rains were going to come. They placed a young woman in a cottonwood tree with a woodpecker as her only companion. She was given a white pearl for protection. There was plenty of food in her little boat. The wise ones gave her instructions what to do when the flood waters came then they sealed the log with pitch and then it began to rain. It rain for 40 days. She was the only person who surveyed the flood. 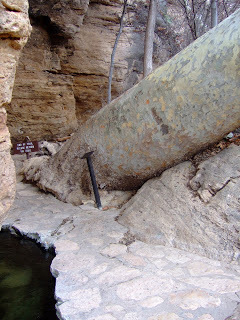 When the water resided her log hit dry land which was a high peak here in Sedona. Then Wood Pecker used his skills of pecking to free her from the hollow log. Today the highest peak of Sedona is Thunder Mountain. It is then said she traveled to a Sacred Place on Mingus Mountains. It was in this Sacred Place the Sun fell in love with her beauty and she became pregnant with child. She then made her journey to Boynton Canyon. There she lived in a cave where she bathed in a sacred pool. She was given the name Kamalapukwia, Old Woman with a Pearl. She gave birth to a daughter whose named was First Lady. 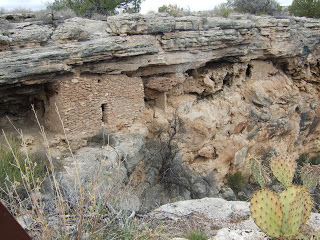 This was the beginning of the Yavapai Nation also known as the People of the Sun. First Lady also gave birth to a son, but that is a whole different story. I find it interesting that other Native American tribes also have legends that dovetail with the Yavapai creation story. The Hopi have legends of the Great Red City of the South. It goes on to say Paluluang, a horned plumed serpent created the Great Flood that wiped out the inhabitance of the third world. It is believed that Paluluang lived at Montezuma’s Well. We do not know for sure that Red Rock Sedona is the Great Red City in the Hopi ‘s legend but there seems to be an interweaving of threads that connect with the Yavapai creation myth. 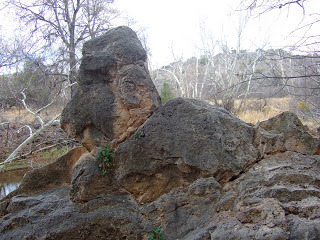 This photo is a rock at Montezuma’s Well if you look closely you will can make out a horned face frowning in the upper corner of the photograph. It’s serpentine body is subtly shown in the rocks. This rock has the appearance of large dragon head. Let your eye follow the lower corner of the photo where the bare tree is standing. This is the snout of the dragon follow the rock’s edge and you will also see the dragon’s eye and the top of his forehead. Naga/Dragons are the rulers of water. The Mohave Native American language also talk about a Celestial Virgin named Arizunna, (Arizona) who was impregnated by the Sun. Ari in Mohave means: sun, holy, good, and beautiful. And the word Urnia means maiden. All of this brings to us to the Sacred Site of the Montezuma’s Well. The well was mistakenly named by the Spaniards thinking it was part of the territory of Montezuma. This warm water source like a primordial womb is a bottomless lake. Even to this day they have not found the source of Montezuma’s Well. There are dwellings around the lake where the Ancient Ones once inhabited. The lake’s water was channeled into an irrigation ditch that would feed the farm lands of the Native People. They grew corn, squash and beans, referred as the three sisters. They also grew cotton which they mixed with yucca fibers to make a strong durable cloth. When I followed the path to the irrigation system I found not only black maiden hair fern which is unusual growing here in the desert climate, but also the largest sycamore tree I ever set eyes on. There was so much energy in the land, that my body flowed into spontaneous Chi Gong movements. The Chi of the this area was strong in the plants, the trees, the air and the purity of the water. When the Chi Gong finished doing me, the most beautiful little bird came to visit. It is known as a Canyon Wren. I looked over to a rock formation and there I saw a rock guardian whose appearance look like a man’s head riding a serpent. My own experience of the Chi Gong that happened while I was in this Sacred Place was like riding the smooth Chi of a Water Dragon. Such Blessings. You might ask yourself what does all of this mean? How does this legends effect me today? I have found that pilgrimage sites hold legends and myths that can be an archetype for the soul’s journey through the human condition. The serpentine energy is a reflection of our own unconscious inner nature that has not been bought into awareness. When we allow ourselves to look at our own unresolved emotions we can see how our unconscious behavior can flood into our life and create destruction. When we go on pilgrimage to a Sacred Sites these archetypes are living in the Earth. When we are available through prayer and silence we are given a chance to reflect, to heal and to rebirth our self with more Awareness. Each site holds it’s own vibration and archetypes that can act as portals into Awareness. When the serpentine energy rises we become Awaken from our unconscious slumber and come home to our true nature.